It's a candelabra-like cluster of old Los Angeles lamp posts meticulously arranged in a row and just off of a bustling boulevard. Except there are no snap-happy tourists here, just shoppers parking their cars on their way into Staples and Payless. 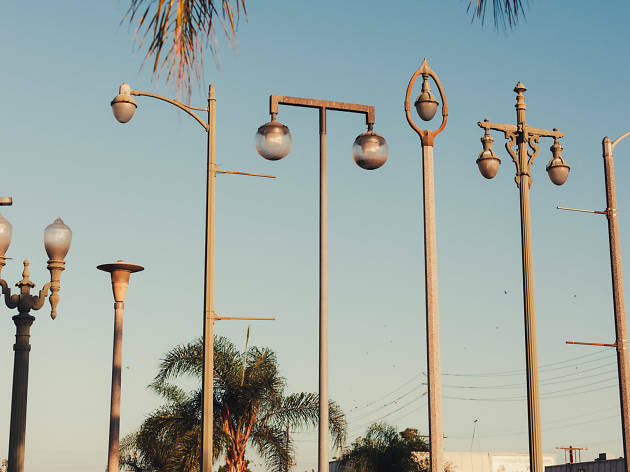 Fifteen years before Chris Burden's "Urban Light" became a permanent fixture outside of LACMA, artist Sheila Klein created her own public work of historic lamp posts. "Vermonica"—a portmanteau of its cross streets, Vermont Avenue and Santa Monica Boulevard—consists of 25 different street lights hand-picked from various eras and locations in Los Angeles. When it was erected in 1993, the installation was meant to be temporary; after all, the Bureau of Street Lighting, which had loaned the lamp posts, would eventually need those lights back. But here we are more than two decades later with "Vermonica" still standing. Klein was able to realize "Vermonica" with the help of a mix of city bureaus, local businesses and volunteers. It was to, according to a statement on the artist's website, "function within and without the realm of art, offering light, history, visual interest and formal composition to anyone who ventures upon it." Klein had originally envisioned a monumental line of lights along Mulholland Drive or in the Baldwin Hills, but those sites proved too complicated. It was the Department of Cultural Affairs that suggested she look at the East Hollywood shopping center, according to an L.A. Times article about the installation's opening. Part of the mini-mall had burned down in the L.A. Riots the year before, so it presented a chance to rebuild. It also happened to be just down the street from the Bureau of Street Lighting's storage yard, a sort of morgue and delivery ward for city lamp posts that you've inevitably come across while looking for parking at the Virgil. Klein, who's now based in Washington, would go on to create a number of still-standing public works in Los Angeles, including a light installation on Pico Boulevard underneath the 10 as well as the interior design for the Hollywood/Highland Metro station, dubbed "Underground Girl." So what about L.A.'s other light installation? 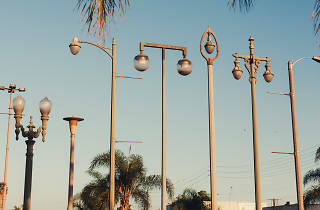 Burden, best known for his aggressive performance art acts in the '70s, had begun collecting old lamp posts in 2000, according to an interview with the L.A. Times. His ever-growing, restored collection of lamps caught the attention of LACMA, and in 2008, "Urban Light" was switched on as the entry piece to the Miracle Mile museum's major renovation. As best as we can tell, Burden never acknowledged "Vermonica" before his death in 2015. 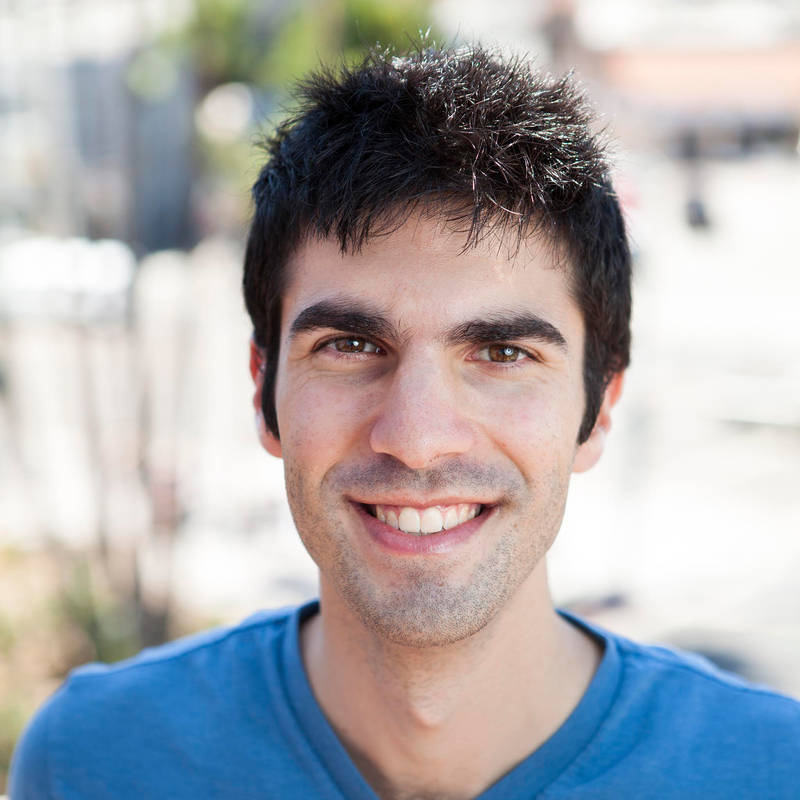 Klein, meanwhile, downplays any similarities as simply "mining the same shaft," according to an interview with the Huffington Post. Because really, the two pieces only share local lamp posts as a common medium; their origins, intentions and aesthetics differ in almost every way. It's no shock that two artists would independently author odes to L.A.'s twinkly lights, and we doubt they'll be the last.